Apollo 11, launched July 16th, 1969, marked the first manned lunar landing mission. Neil Armstrong and Buzz Aldrin lived on the Moon for 21.6 hours (2 hours and 31 minutes of which were outside the Lunar Module Eagle) while Michael Collins orbited the Moon inside the Command Module Columbia. Commonly referred to by the name of the NASA office tasked with their creation, the Manned Flight Awareness medallions mark one of the few known instances when the space agency purposely destroyed space-flown hardware to create a collectible souvenir. Each medallion was minted, in part, from metal flown aboard the mission for which it was issued. Following on from the success of the Apollo 8 Manned Flight Awareness medallion awarded to those in key positions who made the Apollo 8 mission possible, NASA decided to again recognize and award those who had made the Apollo 11 mission possible and landed America on the Moon ahead of the Russian competition. Dr. Preston T. Farish, director of the Manned Flight Awareness office at the Marshall Space Flight Center in Huntsville, Alabama again convinced NASA officials to issue a second medallion; this one commemorating the flight of Apollo 11 and containing material flown during this historic first Lunar landing. One notable difference existed between these two medallions in that the Apollo 8 medallions contained aluminum metal flown in Borman's PPK (personal preference kit) while the Apollo 11 medallions contained metal removed from parts of the spacecraft after the mission. It was agreed that materials from both the Command Module "Columbia" and the Lunar Module "Eagle" would be incorporated into these medallions. The artifacts chosen were a stainless steel heat shield bolt from the Command Module "Columbia" whose function had been to bolt down the heat shield which protected the crew and craft during re-entry, and a "Rock Box" clip used in hoisting the Lunar samples from the Lunar surface into the ascent stage the Lunar Module "Eagle". The majority of this pulley system still remains on the Moon. Dr. Farish personally oversaw the entire development of this medallion including personally adding these two artifacts to the molten nickel-silver at the Meriden Rolling Mill in Meriden, Connecticut. From the ingots, Barco Mint of New Orleans minted 200,000 medallions. The face of the medallion features a well-known image of Buzz Aldrin facing the flag on the Lunar surface (see above). Around the border is the inscription "THE EAGLE HAS LANDED - JULY 20, 1969". The reverse of the medallion carries the declaration of authenticity written in the text "This Medallion contains metal from spacecrafts Columbia and Eagle that took astronauts Armstrong, Aldrin and Collins on their historic Apollo 11 mission that resulted in the first landing of man on the Moon". Originally scheduled to fly with the Apollo 15 mission, it was replaced by LM-10 when it was decided to move into a J-Series "extended stay" Lunar Module instead of LM-9's H-Series configuration. Now on display at the Saturn V Center at the Kennedy Space Center in Florida, it is displayed "as built by Grumman" and is supposed to be ready to be able to go to the Moon (except it is missing the landing radar heat shield and the surface contact probes on the footpads). It is suspended from the museum's roof by four cables, attached to the landing gear outriggers. These are the same mount points used to attach the Lunar Module to the Saturn V's Spacecraft Lunar Module Adapter. 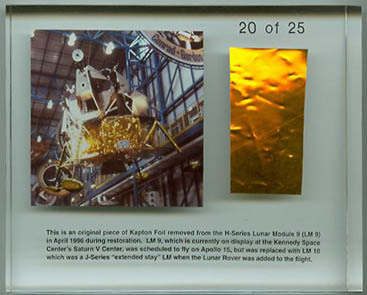 During restoration work on LM-9, some of the Kapton foil, a thin mylar material used to protect the astronauts in outer space, was removed and replaced. The removed foil was used to produced these lucite displays. 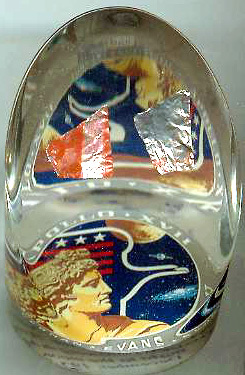 The presentation piece was produced by the same company that did the "Liberty Bell" project for the Kansas Cosmosphere. Each acrylic embedment measures approximately 4" x 5" x 1" and is accompanied by a Certificate of Authenticity from a consultant on the restoration project. There was a total production run of only 25 pieces and each piece is individually numbered and varies slightly because of the size and shape of the foil. This is lucite display #20. 'Kapton Foil', Encased in Lucite, from Apollo 17 Command Module "America"
Apollo 17, launched December 7, 1972, marked the last manned lunar landing mission. Astronauts Eugene Cernan and Harrison Schmitt lived on the Moon for 75 hours (22 hours and 4 minutes of which were outside the Lunar Module Challenger during their moonwalks, during which 243 pounds of lunar material was collected from the lunar landing site, the Taurus-Littrow highlands and valley area) while astronaut Ronald Evans orbited the Moon inside the Command Module America. The embedded swatches of very thin pressure-sensitive Kapton polyamide tape were cut from America's thermal protection subsystem. Applied over the external ablator surface, the tape was coated with aluminum and oxidized silicon monoxide to protect the spacecraft from the extreme temperatures of outer space. This acrylic was produced for the Cernan Corporation, a company which mirrors the skills, professionalism, and dedication of its founder, Eugene Cernan, and specializes in aerospace consulting, space exhibition planning, speaking engagements, and activities with young people. This particular display comes from the private collection of Eugene Cernan. 60 mm diameter medal minted from flown in space metal of ship. Medals issued by Space Flight control center to be presented to ballistics for taking part in control and preparation of Soyuz-Apollo experimental flight July 1975. Front side depicts old logo of Soviet Mission Control Center in Kaliningrad and reads `Soviet Space Flight Control Center July 1975`. On reverse side of medal minted ` To participant of preparation and flight control of space ships Soyuz -Apollo`. Along with medal each ballistic of center received a certificate. First launched on July 16, 1982 from Space Launch Complex 2 at Vandenberg Air Force Base, the McDonnell-Douglas 'Delta 3920' rocket could place 3,451 kilograms into a 185 kilometer orbit, or a 1,283 kilogram payload into geosynchronous orbit. The rocket provided a thrust of 310,630 kilogram-force, and the total rocket weight was 192,360 kilograms. It's core diameter was 2.4 meters, and was 36 meters in length. It costs $38.32 million in 1985. The rocket actually consist of four different stages, each carrying the payload further into orbit. It is basically an upgraded Delta 3910 rocket, but with a larger capacity second stage booster (Aerojet's AJ10-118K borrowed from Titan-3's Trans-stage section). These shaving come from Delta Sequence Number #648, the first Delta 3920 launched. The launch mission's original designation was Delta Prime COSPAR 72A. The rocket design's first payload was the Landsat 4 satellite, weighing 1,942 kg. The satellite had a perigee of 693 km, an apogee of 705 km, and an orbital Inclination of 98.2 degrees, while circling the globe in 98.8 minutes. The satellite's goal was study of the practical applications and uses of space technology for things such as weather or communication. However, shortly after launch, Landsat 4 lost use of half its solar power. This limited the spacecraft's functionality, and prompted the early launch of Landsat 5 to guarantee continued coverage. Gross Mass: 19,501 kg. Empty Mass: 3,000 kg. Thrust (vac): 14,970 kgf. Isp: 444 sec. Burn time: 550 sec. Propellants: Lox/LH2 Isp(sl): 0 sec. Diameter: 4.3 m. Span: 4.3 m. Length: 8.9 m. Country: USA. No Engines: 2. RL-10A-3A Status: Devel. Comments: Centaur for Shuttle payload bay. Cancelled after Challenger disaster on safety grounds. The Soviet Shuttle Buran ("Snowstorm" in Russian) was authorized in 1976 in response to the NASA Space Shuttle program. The building of the five production shuttles began in 1980, with the first full-scale Aero-Buran 'analogue' rolling out in 1984. The first sub orbital test flight of a scale model of Buran took place in July 1983. There were five additional flights of the scale model in following years. Aerodynamic tests of the full-scale Buran analogue began in 1984. This aero-Buran was worn out after 24 test flights and would not fly again. The last of these aerodynamic test flights was in April 1988. The first and only orbital launch of the shuttle Buran was at 3:00 GMT on November 15, 1988. The flight was unmanned, as the life support system had not been checked out and the CRT displays had no software installed. The vehicle was launched on the powerful Energia booster into an 247 by 256 km orbit at 51.6 degrees inclination. The Buran orbited the Earth twice before firing its thrusters for reentry. The flight ended at 6:25 GMT when the vehicle touched down at Tyuratum. The Buran 1 mission was limited to 2 orbits due to computer memory limitations. Although the first orbital flight of Buran was unmanned, it demonstrated much promise. The autopilot that landed the shuttle was able to overcome a 34 mph crosswind to land within 5 feet of the runway center line. Also, of the 38,000 heat shield tiles that covered Buran, only 5 were missing. After the first flight of Buran, funding for the project was cut. Although the project wasn't officially canceled until 1993, much of the work was halted long before that date. There were two other Buran shuttles under construction. The second orbiter, "Ptichka" ("Little Bird" in Russian) was originally scheduled for completion in 1990. The third Buran was due in 1992. Neither was finished. In November 1995, the partially completed shuttles were dismantled at their production site. This is a piece of the titanium alloy honeycomb used on the Buran This material was tested to withstand heat up to 400 degree Celsius. It was produced by Molniya, the corporation who manufactured the Buran.